After the problems I had with the Harmony 675 universal remote, Logitech have sent their latest model, the Harmony 885. The functionality of the remote is the same, i.e. you can program it to replace all your existing remote controls and set activities to switch several pieces of equipment at the same time, so I'll only cover the differences between the older and newer models. The remotes are both the same size, but the 885 is lighter, due to the four AA batteries being replaced with a lithium rechargeable battery, and a charging unit. The three connection points at the back of the remote do not seem to make a snug connection when the unit is resting in the charger and there was nowhere in the manual that gave how long it takes to do a full charge. There are three cells indicating the charge status, but to be safe I left it charging overnight. The black and white three line display has updated to a colour portrait display, and eight function buttons (as opposed to six on the 675). The buttons are all designed to look good and fit into the look of the remote rather than comfort, but they are more tactile and have a better feel as opposed to the small rubber buttons on the 675. The function buttons on the sides of the screen are tiny, but still functional (excuse the pun). 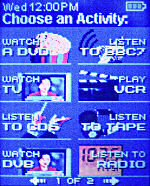 The four colour buttons (which can be used for teletext and interactive services on cable and Freeview) are smaller than ever, and the transport buttons and numbers are better, but in the wrong position. Holding the remote in your hand means the volume, four way controller and channel buttons are easy to reach, but the buttons on the lower half of the remote are difficult to get to without moving your hand or using your other hand. The row of activities buttons at the top have been replaced with one Activities button which is a bit redundant as the Device button toggles between devices and activities. The Glow button switches the display on and lights up the buttons, but if the display is already on, it fades it out and then on again (and makes the buttons glow). Updating from the previous remote was easy, as when I plugged in the device and logged into the website, I click on the Connectivity button and it detected the 885. When I went to customise the device, the extra options for the colour display were available. 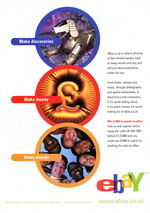 My previous activities were still set up, but several of the descriptions needed changing to cope with the new display. 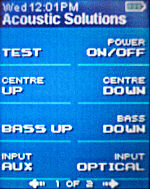 There are two lines for the function/device descriptions, strangely divided into nine characters on the first line and six on the second, using a larger font. Long titles for the functions are handled by an automatic break in the line if there is a space in the description, but shorter lines are put on the bottom line with larger text. 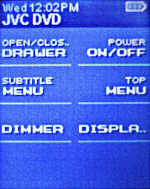 The limits mean that on the setting for my JVC DVD player the word DIMMER is okay, but DISPLAY is shown as DISPLA..). With two line descriptions the OPEN/CLOSE DRAWER tag is abbreviated on the first line to OPEN/CLOS with two dots. This is odd as the two dots just about take up the space the extra E would have. You have no control over the automatic break in the lines (other than the length of the words), so on my surround sound system BASS UP is on one line, but BASS DOWN is on two. It doesn't make any difference to the control, but if you wanted both functions to appear the same on screen, yo would have to add more spaces between the words to force the line break. The display dims after a few seconds of inactivity to conserve power, and there is a tilt control in the remote that detects movement, to switch it back on. The display has coloured icons for the activities and devices, but you cannot customise them. You can change the background colour in the settings, but it still puts a bar along the top. A slide show can be created, with images uploaded to the device. You can set the slide show to run by an option on the menu, or it shows automatically when the unit is recharging. Unfortunately the lack of a full colour display makes the normal pictures look strange and the annoying bar at the top which covers part of the picture. This remote cannot cope with carrier less infra-red codes, which was the problem with the 675 and my old Hitachi television. I was assured by the support team that newer Harmony remote controls would be able to control them, but this is not the case. Users should be aware that this remote may not work with all your devices and old devices may not be programmed using a replacement remote. The range of the remote is still very good, and the display shows a small icon beside the battery indicator whenever you press a button. You also have the day and time shown in the top left corner of the screen. Despite the bells and whistles, the 885 remote doesn't really offer any advantage over the older 675 model. Yes, the buttons are better and the display is bigger, but the odd limitation of the descriptions still makes it an effort to get the tags for the extras functions correct. I could not see the use of a slideshow for the remote, as the only time it comes on automatically is when the remote is charging and the display dims after a few seconds anyway.